Electronics guild maintains classes, equipment and parts for circuit hacking. We communicate on Noisebridge Slack on #electronics. 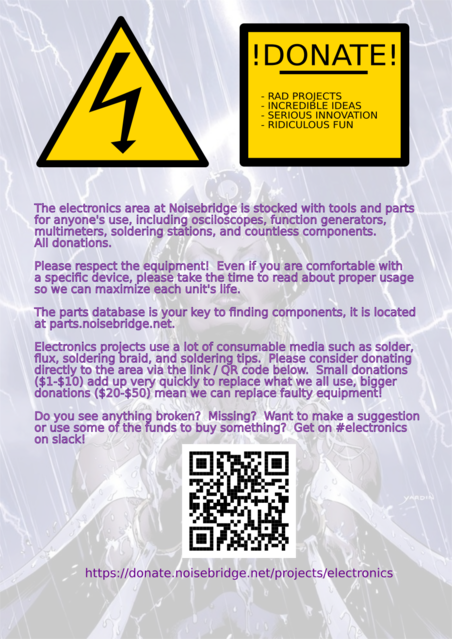 WHAT: Weekly get-together to solder cool stuff! You can easily learn all of the skills you need in one session. Make a project tonight, and take it home with you! If you have your own project (advanced or simple), bring it by, and if you would like help, you can get it! The Electronics Lab is located on the south wall of 2169, straight ahead as you enter the space. It has soldering irons, racks of components, oscilloscopes, multimeters and other electronics related stuff. 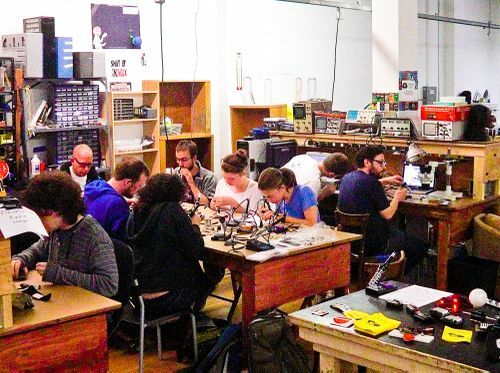 There is a Circuit Hacking event every Monday 7pm till late where you can come to learn how to solder or work on your project with expert help available. Or show up any other time to avoid the rush and work on your own! Go to the Electronics Parts Library page. Circuit hacking has been part of Noisebridge since the beginning at 83C with Mitch's first Soldering_Workshop that paved the way for Circuit Hacking Monday. This page was last edited on 14 March 2019, at 13:02.